﻿ Bradley J. Account of a new discovered motion of the Fix'd stars // Phil. Trans. 1728. 35. Р. 637-641. IV. 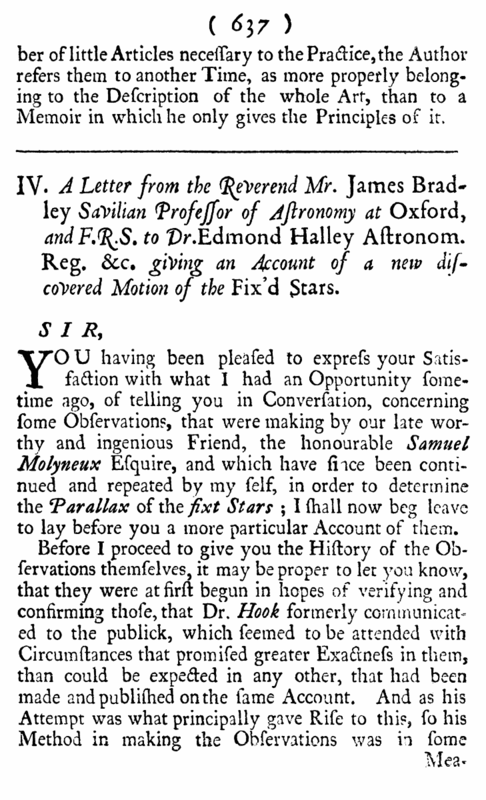 A Letter from the Reverend Mr James Bradley Savilian Professor of Astronomy af Oxford, and F.R.S. to Dr.Edmond Halley Astronom. Reg. giving an Account of a new discovered Motion of the Fix'd Stars. SIR, You having been pleased to express your satisfaction with what I had an Opportunity Sometime ago, of telling you in Conversation, concerning Some Observations, that were making by our late worthy and ingenious Friend, the honourable Samuel M’olyneux ESquire, and which have since been continued and repeated by my Self, in order to determine the Parallax of the fixt Stars ; I Shall now beg leave to lay before you a more particular Account of them. MeaSure that which Mr. Molyneux followed : For he made Choice of the same Stars and his instrument was constructed upon almost the same Principles. But if it had not greatly exceeded the Doctor's in Ex-actneSs, we might yet have remained in great Uncer-tainty as to the Parallax of the fixt Stars; as you will perceive upon the Comparison of the two Experiments. This indeed was chiefly owing to our curious Mem-ber, Mr. George Graham, to whom the Lovers of Astronomy are alSo not a little indebted for Several o-ther exact and well-contrived Instruments. 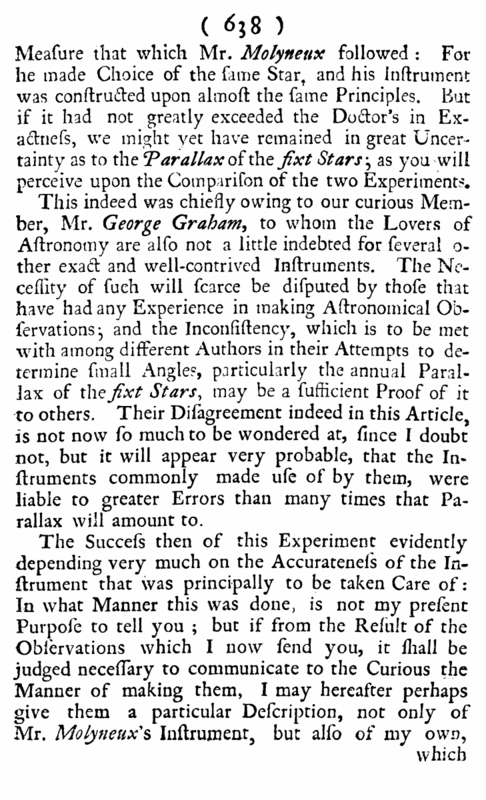 The Ne--cesslty of such will Scarce be disputed by thoSe that have had any Experience in making Astronomical Ob-Servations; and the Inconsistency, which is to be met with among different Authors in their Attempts to determine Small Angle?, particularly the annual Paraljax of the fixt Stars, may be a Sufficient Proof of it to others. Their Disagreement indeed in this Article, is not now So much to be wondered at, since I doubt not, but it will appear very probable, that the In-struments commonly made use of by them, were liable to greater Errors than many times that Parallax will amount to.